Dinner is ready, let’s eat! What type of emotion comes to your mind when you hear that phrase? Happiness, worry, satisfaction, or frustration? Many parents faced a daily battle making sure that their children are eating healthy. I recently attended the Society for Nutrition Education and Behavior annual meeting in Portland, Oregon, and had the opportunity to listen to two excellent presentations from nationally recognized nutrition experts. Ellyn Satter and Dr. Michelle May exposed their points of views about us and the relationship we have with food. Ellyn is recognized for her work related to the dynamics of feeding between parents and children. And Dr. May is well known for her book titled “Eat what you love, Love what you eat”. Ellyn reminds us that we need courage to allow our kids to develop their individualities related to eating. Our job as parents is to expose them to a variety of foods and to refrain from giving them only the ones they like. If we do a good job, then we should allow them to decide how much they are going to eat. It is important that parents set a good example about how to behave at the dinner table; if we want them to eat healthy, then we have to do the same. Dr. May reminds us in one of her articles that children are born with the ability to know when they are hungry. They express it with their cry and also when they spit food back to us when we are feeding them with a spoon. There is when the battle to convince them to eat more than what they need starts, framed by our own experiences. Dr. May agrees that kids need to use their own cues to decide when and what are they going to eat. Once again, the parent’s job is to provide nutritious and fun foods, teach them to eat in moderation and showing them a great example by practicing an active and healthy lifestyle. 1- Remember that kids need to be exposed to a new food between 7- 15 times for them to be able to develop the taste for a food item even if they did not like before. 2- Do not pressure them to eat. 3- Encourage them to eat different foods by using descriptive words like soft, sweet and crispy. 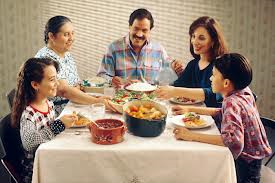 4- Introduce new foods when eating at the table together. Use the family dinner style serving the food in dishes that allows everybody to serve themselves. 5- Remember that each child is different and the way they eat is an essential part of their personality. I hope that the next time you hear “food is ready please come eat”, all the family members will come to the table with a smile full of satisfaction even before tasting the first bite. My son Nicholas is having soccer practice three times a week in the evenings, and games on the weekends. To plan healthy, well-balanced meals and snacks on my tight schedule, I use MyPlate, the nutrition guide published by the United States Department of Agriculture, as a guide. Meal planning and health tips can be found online at ChooseMyPlate.gov. If we have to eat fast food, we look up for options that are lower in fat and calories. We decide what will be ordered before going into the restaurant. Unfortunately low sodium foods are rare in fast food or any restaurant, but we eat lower sodium foods at home to make the overall intake of sodium less. About 17 percent of fast food menu items can be considered “healthy choices,” according to fastfoodmarketing.org. On kid’s menus, approximately 12 of the 3,039 possible meal combinations meet nutritional criteria for preschoolers, and 15 combinations meet the criteria for older children. To help on-the-go families, UGA Extension provides a few tips for healthy snacks and meals. Simple snacks: plain, dried or paired fruits with sorbet or cottage cheese, yogurt, whole grain cereal, 100 percent frozen fruit bars, nuts for older children, trail mix — made with whole grain cereal, nuts and dried fruit —, homemade fruit breads and muffins (such as banana bread or carrot muffins), low-fat cheese with wholegrain bread or hummus and whole grain pita. Planned snacks: A few snacks that can be made at home, then stored in a cooler or otherwise retained away from home include peanut butter sandwiches, salads with light dressing, milk in small boxes, hard-boiled eggs, single servings of cottage cheese, cut-up vegetables with light dip made with plain yogurt and homemade soups in thermos bottles. 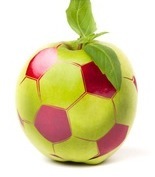 Before and after practice snacks: Cut-up fruit and/or vegetables, yogurt, milk, half a sandwich made with real turkey (not lunch meat) or low-fat cheese or whole-grain crackers and low-fat cheese make good snacks for active kids. For a long time, we have worried about the food selection available to our children at school. Pizza, fried chicken, French fries, dessert, and high sugary drinks have been the order of the day. 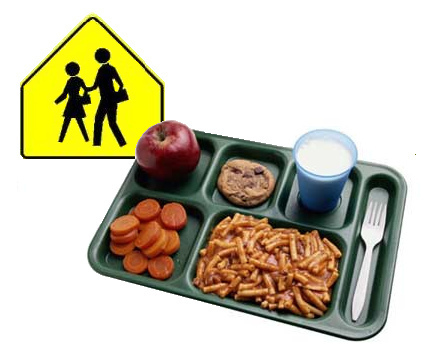 Recently, the U.S. Department of Agriculture, which is responsible for evaluating school lunch requirements, has initiated an extensive revision of the rules schools must follow in order to ensure that our kids and young people have access to healthy meals. According to Connie Crawley, a nutrition and health specialist at the University of Georgia, almost 75% of students in Georgia eat in their school cafeterias. They are the ones who will experience the changes to the cafeteria menu: less fat, less sugar, and less salt. Many of the proposed changes will not be in effect for many years, but the system has taken important steps towards offering a healthier and nutritious lunch. The changes proposed by the U.S.D.A. address a number of concerns. For example, salt content will be restricted, foods that are high in fat will be substituted by healthier options, some dessert options will have fewer calories, and milk must now be either low in fat or non-fat. Unfortunately, school cafeterias will still include options that are not as healthy, so it is necessary to continue collaborating as a community to improve nutrition in this setting. It is important that parents and childcare providers join forces with officials in order to help students get used to the changes. The food that we prepare for our children at home should match the new options they will get in the school cafeteria, so that they receive consistent messages about healthy food choices. Health at home, health at school. Let’s motivate them to choose the best: low fat or nonfat milk, fruit and yogurt instead of cake, and fruit instead of juice. The new alternatives will be important tools in our fight against the obesity problem! Let’s toast, with a delicious and refreshing glass of water, to the proposed changes. Cheers!